Drilling is the most common machining operation. 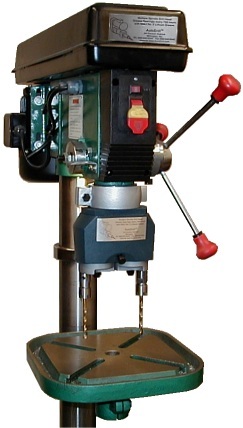 Drill presses are available in almost every industrial and manufacturing operation. AutoDrill has made the attachment of an adjustable or fixed pattern multiple spindle head to a drill press a simple two step process. A drive adapter made specifically for the drill press is provided with every multi-spindle head. Simply remove your existing drill press chuck and install the multiple spindle head to drill more than one hole at a time. AutoDrill keeps many heads and drill press adapters in stock. Drill press adapters are available for Morse Taper, Jacobs Taper and other methods of driving multiple spindle heads.